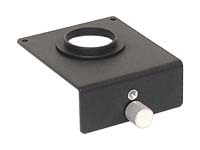 By removing the lamphouse and installing this Copy Camera Adapter to attach your camera body, you can turn your Omega B-22, B-66, B-600, or C-700 enlarger into a copy camera. Enlarging lenses from 50mm to 90mm focal length can be used to achieve a wide range of magnifications and reductions. The two holes at the rear of the adapter plate fit over the locating pins at the rear of the negative stage. The knurled screw is then used to secure the adapter in position. The kit includes the adapter plate, securing screw, T-mount adapter ring, and instructions. Note: A T-mount, available elsewhere, is required to mount your camera body to the adapter. These adapters are used and may have minor cosmetic marks from previous use, but are certified to be in perfect working condition.